An amazing chef, yes. But did you know he made footwear? Emeril's Footwear features functions and attributes that are specifically tailored to the restaurant environment, while offering both style and substance. The Emeril footwear line of slip resistant work shoes was established to support hospitality employees who work long hours on their feet. These work shoes are specifically designed and constructed for food service and restaurant workers, bringing style and comfort together in a slip-proof and water resistant shoe. Emeril’s line of slip resistant work shoes will help you get the job done comfortably and safely. All of Emeril’s Footwear ulitlize AllShield water resistant hydrophobic spray that is applied to the surface of the shoe to provide stain and water resistance. In addition, an Agion anti-microbial breathable lining is added to help keep feet fresh and reduce odor on the lining. A flex-channel rubber outsole with specially designed lug pattern is used to provide maximum slip resistance. An anti-fatigue comfort midsole is made with a high energy return compound to support the foot. The B.A.M (Balanced Active Movement) technology provides a double layer molded memory foam insole to provide 24-hour comfort. These hi-tech features and essential benefits are unique to all Emeril Footwear. I got the Quarter Slip On Mesh Shoes, and wear them just about everyday to work, and I am in love! 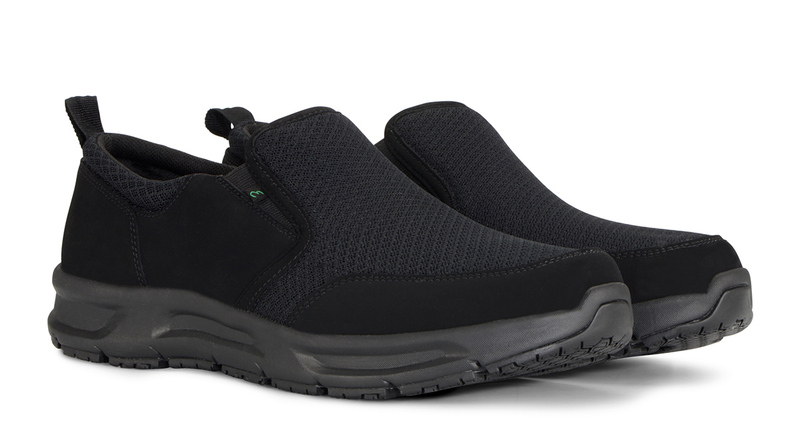 The Women’s Quarter Slip On Mesh is an athletic slip on work shoe that features a nubuck leather and mesh upper, a pull tab for easy on, and a gusseted tongue to keep debris out of the shoe. Check it all out at Emeril's Footwear on Facebook.